From left: Sam Tanabe, Katy Sullivan, and Tonasia Jones in "Finish Line." More than 1,000 light bulbs illuminate “Finish Line,” brightening what was a dark day in Boston history. Subtitled “A Documentary Play About the 2013 Boston Marathon,” “Finish Line” is the product of nearly 100 interviews and thousands of pages of transcription whittled down to an intermissionless 90 minutes. 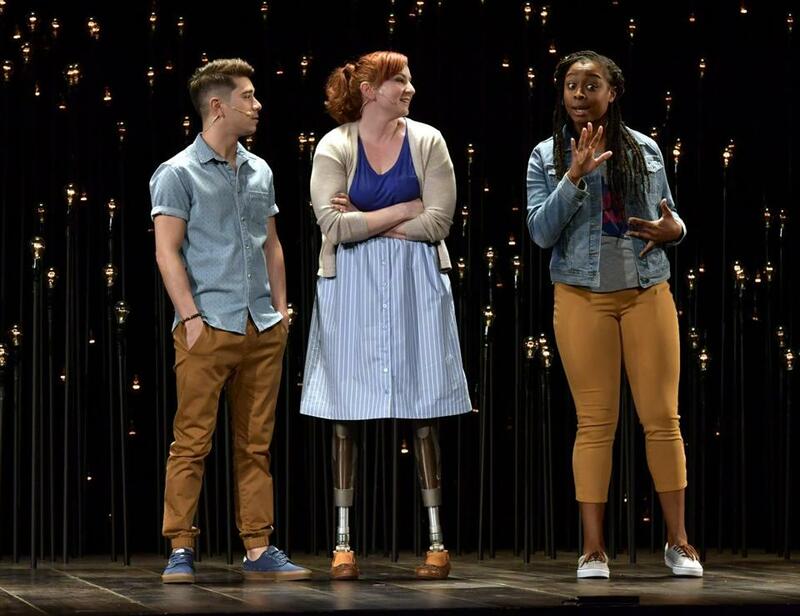 At the Shubert Theatre Wednesday, it brought the Boston Marathon bombing into stark relief. “Finish Line” was created by Joey Frangieh, producing artistic director of Boston Theater Company, and Lisa Rafferty, who teaches theater at Bridgewater State University. The play, getting its world premiere at the Shubert, does not concern itself with the individuals who set off the two homemade bombs near the finish line of the Marathon on April 15, 2013, or with the manhunt that followed. Its focus is on the runners, the spectators, those who were injured, and those who came to their aid. The stellar cast of 11, playing 14 different roles, includes local thespians Karen MacDonald, Paula Plum, Amie Lytle, Lewis D. Wheeler, Greg Maraio, Ed Hoopman, Danny Bolton, Tonasia Jones, and Omar Robinson plus Sam Tanabe and Los Angeles actress and Paralympian Katy Sullivan. Most of “Finish Line” is related in the present tense. Teacher and runner Brad Jensen (Tanabe) starts it off by talking about Boston 2013 as his first-ever marathon, what it’s like to train, to arrive at 5 a.m., to worry about finishing, to hear people yell, “Go Brad!” Others gather, everyone clearly identified via overhead projection. We hear from Globe photographer John Tlumacki (Bolton), charity coordinator Paula McLaughlin (MacDonald), WFXT news anchor Maria Stephanos (Plum), physical therapist Lee Ann Yanni (Jones), and Boston Children’s Hospital physician and Marathon 2013 participant Jane Montgomery (Sullivan). Everybody’s psyched; it’s a typical feel-good Patriots Day. Then the first explosion goes off. There’s no sound; the ambient music that’s been playing simply stops. No one’s sure what’s happened. Montgomery (this is an alias; the real doctor didn’t want her name to appear in the play) has already finished the race; now she jumps a barricade and goes to help. Tlumacki, walking through blood that’s as sticky as molasses, takes photos; Stephanos calls her TV station and goes on the air. Yanni realizes there’s a bone sticking out of her leg; soon she’s on her way to Tufts Medical Center. The wrap-up is emotionally, if not dramatically, fulfilling. Richard Webster (Hoopman), director of music at Trinity Church, describes how Temple Israel hosted a Trinity service after Copley Square was closed off for the investigation. One by one, the cast members gather on stage, and we hear comforting phrases like “Boston kind,” “hug somebody,” “pay it forward,” and “from darkness comes so much light.” Rachel Belleman sings Frangieh’s inspirational “RISE.” Still, after an enormity of this magnitude, words tend to pall. The real victory is embodied in those thousand points of light.